On February 20th, PCA&D hosted their 7th annual Designathon event. With the assistance of countless gallons of coffee, 25 students and 8 faculty members worked over a 24-hour period to create high-quality logos, brochures, websites and other promotional design materials for 8 local non-profit organizations. 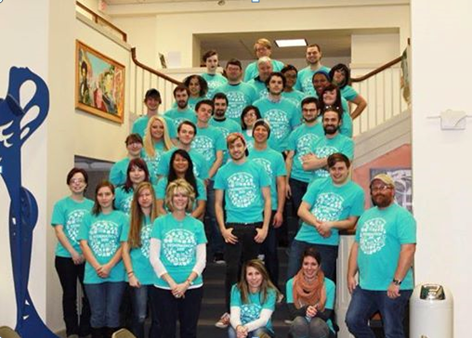 Designathon is an extremely rewarding event for PCA&D students. Through endless hours of hard-work and dedication, the students consistently manage to maintain levels of enthusiasm and excitement. This event provides them with the opportunity to work hands-on with real clients, fully capturing the essence of each client’s vision, all while giving back to the community. This year’s 24-Hour Designathon ended up turning into a 19-Hour Designathon due to the snow. Although the students had less time to complete their work, they all did an outstanding job accomplishing their tasks and exceeding all clients’ expectations. Thank you to everyone who was a part of this year’s event! Enjoy an inside look at Designathon 2015 with a brief SlideShare.